Here, you will find a collection of Learn Japanese PDF Lessons. All FREE for you to download, print and learn with. I highly recommend printing as having tangible study material and writing on them will do you MUCH MORE than reading them online ever will. Bookmark this page because it will be continuously updated. 1. How to Learn Japanese PDF: What’s the best way to learn Japanese? Hint: It’s not your material, it’s you. This PDF lesson goes over goal setting, learning tactics and the “mindset” for success. This is something Japanese beginners must know about. 2. Learn How to Write Katakana: This Japanese PDF Lesson contains 10 exercises that will help you master writing Katakana. You should print SEVERAL copies of this lesson to practice again and again. Perfect for Beginners. Click on the image to download. 3. 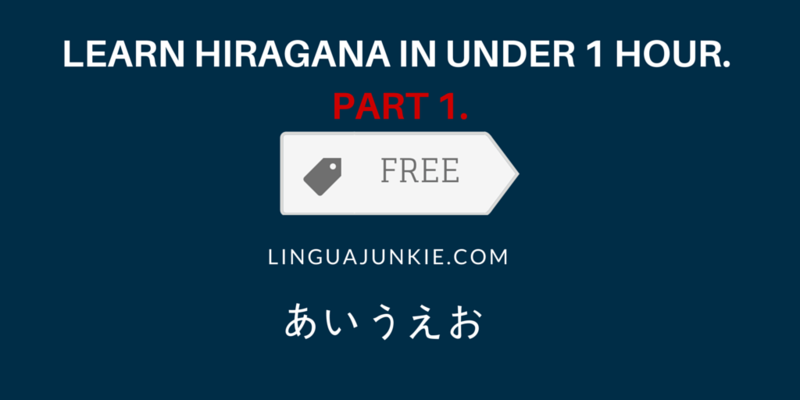 Learn Hiragana in 1 Hour (Part 1). This is a down and dirty lesson on how to learn Hiragana QUICKLY from our friends at Linguajunkie.com. It’s a step by step guide on how to learn it faster. No need to print this. Click on the image to download. 4. Learn Hiragana in 1 Hour (Part 2). Here’s part 2 of the Hiragana Guide from Linguajunkie. By the end of this lesson (if you did part 1) you should be able to learn Hiragana within 1 hour. 5. Learn Katakana in 1 Hour Part 1: This is similar to the Hiragana guides above by Junkie. Not quite for practicing (like mine) but some really good tips on learning FASTER. Because seriously, if you’re learning an alphabet apps, flashcards and YouTube vids, you are WASTING time. 6. Learn Katakana in 1 Hour Part 2: This is Junkie’s second part of mastering Katakana and useful tips on learning fast. Definitely use this with my guide as well. 7. Top 100 Japanese Words: What are the most common Japanese words? 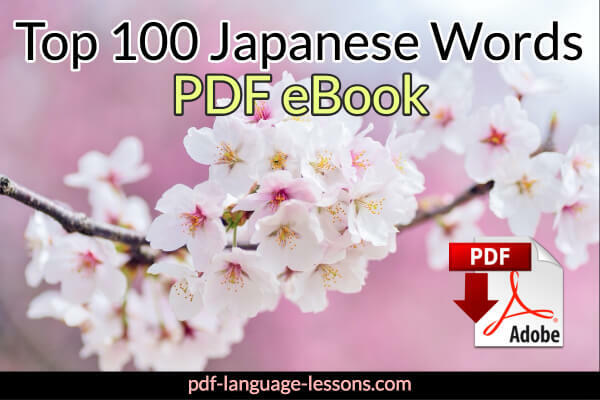 in this Japanese PDF lesson, you’ll learn the top 100 nouns, verbs and adjectives. If you’re a beginner, download, save and review this until you master them all. 8. 40+ Common Phrases & Questions for Beginners: Aside from words, you should also learn beginner-level Japanese phrases. 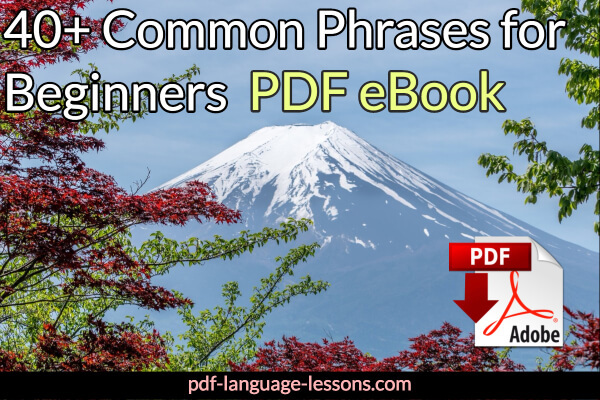 This quick PDF lesson teaches you common greetings and questions that are used everyday in Japanese. 9. 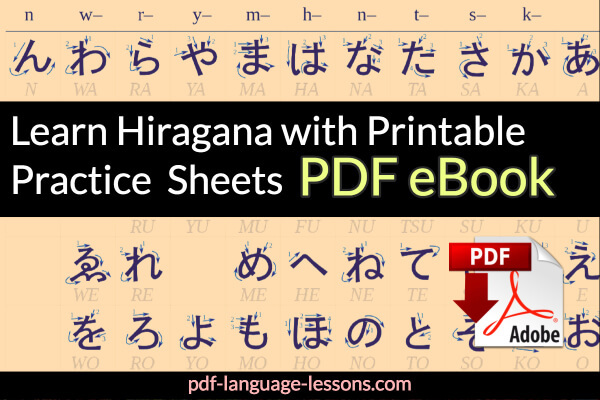 Learn to Write Hiragana: Want to learn to write Hiragana? Download this PDF guide. Even better, print it out and follow the writing instructions inside. You know what’s great about Japanese PDF lessons? PDFs are eBooks. That means you can download and read them on any device. You can even print them out as “physical” study material. By the way, please tell me: What learn Japanese PDF lessons would you like to see? Leave a comment down below with your requests and suggestions. Also, if there are any mistakes, be sure to report them as well! P.S. I highly recommend this for Japanese learners. 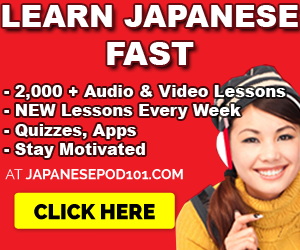 If you REALLY want to learn to Japanese with effective lessons by real teachers – Sign up for free at JapanesePod101 (click here) and start learning! Tou get 2,000+ audio/video lessons, lots of PDFs, study tools and everything you need and get fluent. This entry was posted in Japanese and tagged Japanese PDF Lessons, Learn Japanese PDF by admin. Bookmark the permalink.